We offer 4 holidays covering the whole route. The 6 day holiday has 4 long days and should only be attempted if you are fit and used to walking long distances day after day. The 9 day trip is done at a more leisurely pace. Most people spend 7 or 8 days walking the whole St Oswald’s Way. Please bear in mind that both the 6 and 7 day options include 3 or 4 long days of between 15 and 20 miles. Of all of our St Oswald’s Way holidays, this is the one for the serious walker, covering the whole route in 6 days. Four of the days are 15 miles or more. If you are a fit walker with limited time available this is a good choice. Your walk starts on the island of Lindisfarne, one of the most important early centres of Christianity in England. You cross the Holy Island Causeway to the mainland, and head inland. Walking on easy tracks and through woodland, you reach the old market town of Belford, perhaps stopping en route for a detour to visit St Cuthbert’s Cave. Heading east, you meet the sea again at Bamburgh, King Oswald’s capital, with one of the finest castles in the UK. Next stop is Seahouses, where boats take visitors to the Farne Islands, home to puffins, guillemots and arctic terns. Then, following some of the most spectacular coastline in Britain, you pass Beadnell, with its tiny harbour and imposing lime kilns, until eventually the ruins of Dunstanburgh Castle come into view. Just beyond here is the fishing village of Craster, famous for its kippers, then further south again is Alnmouth, boasting one of the oldest golf courses in England. A walk through coastal dunes, with splendid views of Coquet island, brings you to the historic market town of Warkworth, with its imposing 12th century castle and links with the Percy family. The trail leaves the sea at Warkworth and follows the Coquet Valley inland. You walk along tracks and lanes, and through fields, crossing the River Coquet at the village of Felton. Walking on pretty riverside paths and through semi-native woodlands, you cross the river again at Weldon Bridge, near an 18th century coaching inn, The Angler’s Arms. Passing very close to the restored 12th century Brinkburn Priory, you eventually reach a disused railway track which takes you to the peaceful, historic market town of Rothbury. The Way leaves the River Coquet at Rothbury and heads south, passing through some of the most, beautiful, interesting and ancient features of the trail. Entering the Northumberland National Park, you pass Lordenshaws, an important archaeological site. Here you will see an Iron Age hill fort and some mysterious Neolithic rock art. The path rises up over open moorland, with spectacular views of the sandstone formations on Simonside, to the highest point on the trail, Coquet Cairn. Here it enters Harwood Forest, where you walk on forest tracks, often getting lovely open vistas of the surrounding landscape. Leaving the forest behind, you cross wide open fields and farmland, to reach the village of Kirkwhelpington. Continuing south, you walk along paths and tracks over gently rolling countryside. You go through several pretty villages and ancient settlements, and pass some glorious viewpoints. Eventually you reach the Military Road, built by General Wade in 1745, along the line of Hadrian’s Wall. From now on you walk west along Hadrian’s Wall Path, until you reach the end of the trail, at Heavenfield, where King Oswald had his famous battle victory. The route starts on the coastal path, along beaches and dunes, before turning inland through rolling countryside and moorlands. If you are a regular walker this route should be within your capability. Terrain: A walk of two halves – the coastal path is pretty straightforward. If you walk on the beaches stick to the more firm, sea washed sand. Once you turn inland the route follows tracks, paths and lanes along the River Coquet, then southwards over moorlands, forests, and fields. What’s it like underfoot? On the whole the paths are well defined and maintained, but at times the countryside section can encounter some muddy paths, so good footwear is essential. How Much Up & Down? There is a climb of 300m (1000ft ) after Rothbury, and a smaller one of 150m (500ft) between Lindisfarne and Belford. Otherwise pretty flat along the coastal section and rolling countryside, with small climbs inland. Navigation: Pretty straightforward, but you do go through some remote countryside, so make sure you can read your map. Maps A waterproof map from Harvey Maps covering the whole route. Good accommodation and friendly hosts are an essential part of any holiday. We understand this and go out of our way to find the best. We put a great deal of effort into hand picking our accommodation and matching it to individual customer requirements. As well as visiting the accommodation ourselves, we ask all our customers to complete a short evaluation on each night’s accommodation, which then gives us an insight in to the day-to-day operation, and lets us spot any potential issues before they become a problem. We use a variety of accommodation, including small country house hotels, guest houses in market towns, bed and breakfasts in farm houses, country cottages and Victorian town houses. In selecting the accommodation we look for helpful, friendly hosts with good quality, characterful accommodation close to the trail. For example, over the course of your trip you might stay in a village inn, a bed and breakfast in a converted barn, a Victorian guest house, on a working farm, and in a Georgian hotel. We always try to arrange en suite accommodation, i.e. rooms with their own bathrooms for each night of your stay. However, in some of the more remote locations accommodation is limited and occasionally we may have to book rooms with shared bathrooms for one or two nights of your holiday, (especially if the booking is made at short notice), but we will always let you know if this is likely to be the case. By Air: The nearest International Airport to the trail is Newcastle. There is a Tyne & Wear Metro station at Newcastle Airport with frequent services to Newcastle Central Station (journey time approx. 30 min). By Public Transport: The most convenient railway station for Holy Island (Lindisfarne) is Berwick-upon-Tweed. Berwick station (BWK) is located on the East Coast Main Line with hourly trains between London Kings Cross, Newcastle and Edinburgh. Alternatively, you may wish to make the journey by taxi but again this will be restricted by the tides (journey time approx. 35 min). There is a taxi rank at Berwick station. We can provide you with taxi company numbers if you wish to pre-book. By Road: Holy Island (Lindisfarne) is located just off the A1 trunk road between Alnwick and Berwick-upon-Tweed. Please note that the Island is only accessible across a causeway at low tide. Details of the safe crossing times can be found at: Northumberland life We also supply details about the safe crossing times during your stay in your holiday pack. By Public Transport: The nearest Railway Station to Chollerford is Hexham. Hexham station (HEX) is located on the Tyne Valley Line with fast and frequent trains between Newcastle and Carlisle. The nearest bus pick-up points to Chollerford are Humshaugh and Low Brunton Crossroads. From either stop, the 880 bus service runs frequently to Hexham Railway station (journey time approx. 30 min). Between April and October, the AD122 bus service runs between Chesters Roman Fort (near Chollerford) and Hexham Railway Station (journey time approx. 10 min). Alternatively, you may wish to make the journey by taxi (journey time approx. 10 min). By Road: Chollerford is located on the B6318 between Newcastle and Carlisle. From the West (Carlisle): Leave the M6 motorway at Junction 43 and follow signs for the A69 Hexham. Approaching Greenhead, follow the signs for the B6318 to Chollerford. The Holy Island of Lindisfarne is an excellent place for a rest day. Because the Island is only accessible across its tidal causeway, you may be restricted by the tide times and not have sufficient time to visit all that it has to offer before your departure. As well as its historic attractions of the Castle and Priory, Holy Island is situated at the heart of the Lindisfarne National Nature Reserve. Please note that Lindisfarne Castle is closed on Monday's. Rothbury is a pleasant market town straddling the River Coquet, with a number of shops, cafes, and tearooms. Cragside House, Gardens and Estate, former home of the Victorian industrialist Lord Armstrong is situated a pleasant 2 mile walk from Rothbury and worth a visit at anytime of the year. The first house to be lit by hydro electricity, Cragside is also now one of the last strong holds of the red squirrel. 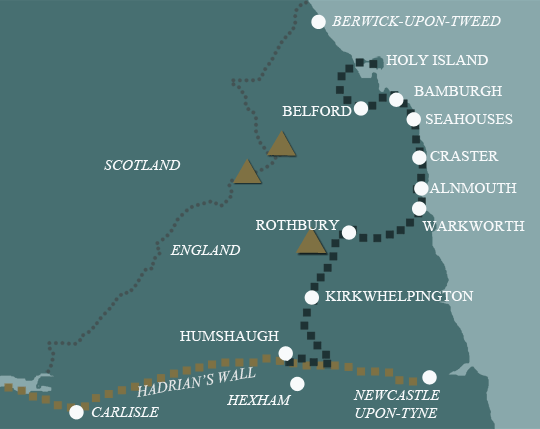 A great route linking the Northumberland Coast with Hadrian's Wall, through the quiet Northumberland countryside. Start on Holy Island, with its castle, ruined priory, and seal colony. Finish with a visit to Chesters Fort on Hadrian's Wall. 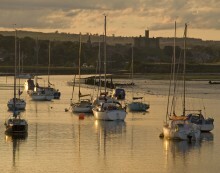 Follow the Northumberland coast along sweeping beaches linking old fishing villages, and dotted with dramatic castles. Lots of history - mediaeval castles, prehistoric settlements, and the Roman Wall.